adapted as "One for the Money"
Synopsis: Watch out, world. Here comes Stephanie Plum, a bounty hunter with attitude. In Stephanie's opinion, toxic waste, rabid drivers, armed schizophrenics, and August heat, humidity, and hydrocarbons are all part of the great adventure of living in Jersey. She's a product of the "burg," a blue-collar pocket of Trenton where houses are attached and narrow, cars are American, windows are clean, and (God forbid you should be late) dinner is served at six. Now Stephanie's all grown up and out on her own, living five miles from Mom and Dad's, doing her best to sever the world's longest umbilical cord. Her mother is a meddler, and her grandmother is a few cans short of a case. 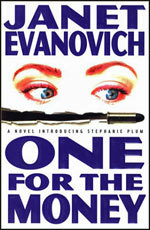 Her first assignment: nail Joe Morelli, a former vice cop on the run from a charge of murder one. Morelli is also the irresistible macho pig who took Stephanie's virginity at age sixteen and then wrote the details on the bathroom wall of Mario's Sub Shop. There's still powerful chemistry between these two, so the chase should be interesting.